Once a child is born, his or her parents need to have all the products like a quality baby potty chair, comfortable baby swing, baby bouncers and baby bath tubs to take good care of the baby as well as to keep the baby happy. It is important to keep the baby safe as well. Usually, parents think that the home is the safest place for their child. However, every house has some areas that are not recommended for young children to explore. Therefore, to keep you away from the panic, the baby gates are a great invention that will keep your child safe from accidents. Well, yes! 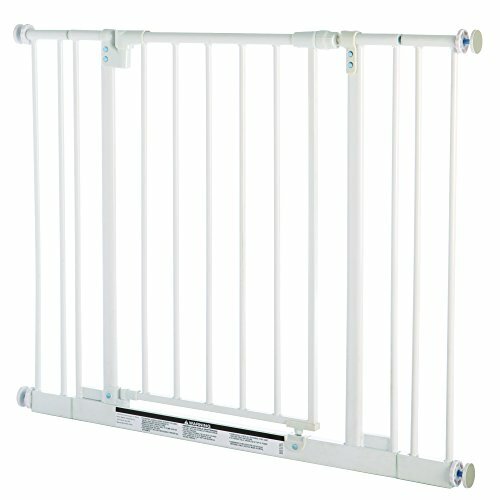 Baby gates will keep your child in a safe zone while you can do other things. Because we are talking here about children’s safety, we have been very fastidious in choosing the best baby gates. We searched on the internet and took into consideration the safest mechanisms existent on the market. The main criteria we used for our research were quality, overall safety, and usefulness. We paid attention to choosing the best baby gates after reading and researching the customers’ reviews and comments. Even though it may seem an easy job, believe us, it was, in fact, tough. As we are dealing with the children’s safety, we had to be extra careful in choosing the best products. 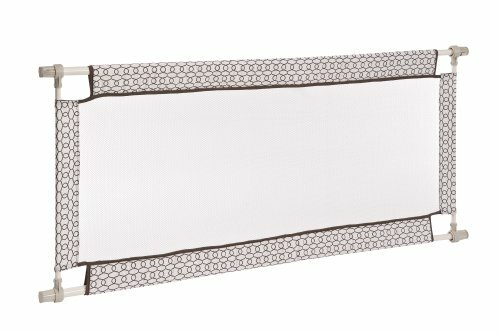 In the end, we created the below a top of 10 baby gates which, we consider that will fit in every home and will give you peace of mind. If you are looking for something unique, North States will impress you with this playard. We are talking here about a different kind of baby gate. It is a colorful enclosure made of six sturdy panels. At a close look, it resembles like a big cage where your child can play safely on his play mat. It offers a space of 34.45 square feet, and it reaches 26 inches high. The producers added non-slip pads to make sure that the enclosure will not move while your child is inside. These pads also protect your floor from scratches. If you are looking for an assembly that you can install easily, then this is the right fit for you. Once your child is not playing inside anymore, you can easily fold it and place it in your storage room. It weighs less than 20 pounds. This means that you can fold it and take it with you whenever you want. Whether you are taking your kid to his grandparents, or opt for a vacation, you can take it with you. Are you looking for an efficient baby gate that also fits the aesthetics of your home? Then it means that the North States had read your mind when they designed their baby gates. The gate’s mechanism can be installed on any surface, whether you want to put it on a flat or angled surface. It will keep your kid safe at it can extend up to 72 inches wide. It is 30 inches tall making very difficult for a small kid to climb over it. You can put it in any opening or passageway of at least 38.3 inches width. Adults can easily open and close it. However, when it comes to children, this is mission impossible for them. This is why this baby gate received additional points in terms of increased security. Parents love this baby gate because it can be bolted on any sturdy surface without compromising the child’s security. The producers thought also of an additional panel to make this product a versatile one. You can practically install it on various openings in your home. It will fit just perfect every time. This baby gate has it all: easy installation, sturdiness, and efficiency. This one-handed walk-through baby gate is ideal for any space and even for the narrow ones. It can be adjusted from 44 inches wide up to 72 inches. Therefore, you can install it in any area of your home you want to. It can be bolted on any surface. This means that your child will be safe and you do not have to worry that he will open or climb over it. The producers thought also of the hard work you put when you built your home. This is why they used a Soft scratch guard material for the bottom layer. This material prevents the floor from scratches. Regarding design, they followed an elegant and modern line to fit in any home’s aesthetics. Many parents are very happy with this choice, and most of their reviews applaud the product’s sturdiness. Also, they like the four clever mechanisms that can be removed quickly or set back up whenever it is necessary. CUSTOMIZABLE WIDTH - This safety gate adjusts to fit doorways and openings between 28 and 42 inches wide and is 24 inches high. SECURE AND STURDY - Gate features a durable bamboo frame and recycled plastic panels. It also includes non-marring bumpers to protect your woodwork from unwanted dings and scratches. COMPACT DESIGN - The Safety 1st Bamboo Doorway Gate slides together for storage so that it can easily be put away and out of sight when it is not being used. When we talk about Safety 1st products, we think about increased level of safety and innovation. 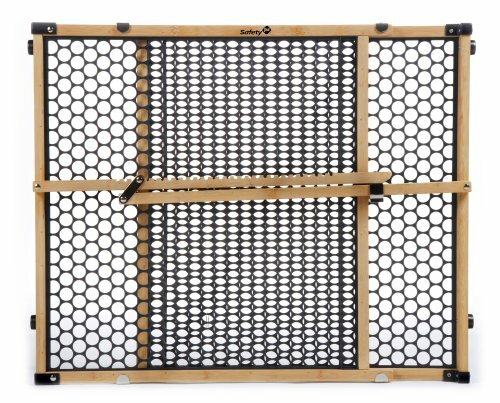 If you are the type of person who thinks a lot of environmental protection, then you will most definitely like this baby gate. It is made of 100% recycled plastic with a strong bamboo frame. You can easily install it on passageways that have a width from 28 to 42 inches. 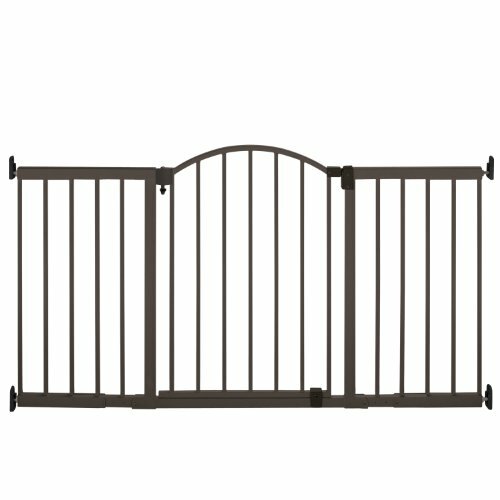 The height of the gate is 2 feet, being considered a medium height for a baby gate. You will definitely like the easy installation process. You do not need any tools or additional help to be able to put it wherever you want. It uses the pressure-mounted system, and so you can easily accommodate it anywhere. For the price you pay for it, this baby gate does exactly what it was meant to do. It is well built and sturdy enough to keep your kid safe in his play area. Are you looking for a stylish and yet very efficient baby gate? If you have an energetic baby who would try to shake it and find a way to remove it, this baby gate is remarkably safe as it once it is installed it will not move. Parents appreciate how sturdy it is. It also has a wide opening. Therefore, it can be installed in various places from the house. What is more, the pressure-mounting system is a good match in most homes. Thanks to this system, you will not have to drill any holes in the wall to install it. The combination of wood and metal is very interesting and will fit in any home design. The fact that it can open from 36 to 60 inches wide makes most users like it even better. This baby gate is a perfect match for spaces that are somewhere between 29.5 and 38.75 inches wide. It is also 30 inches tall, which is considered by many parents a safe height for their kids when they install a baby gate. The North States makes the difference with this product thanks to the triple lock system. Parents can easily lock and unlock it. However, when it comes to kids to open it, it will be tough to manipulate it. Therefore, you can tick on your features list the increased degree of safety. The producers used a highly durable metal when they made this baby gate. You can also choose from some variations of colors. This makes it a versatile fit for most homes. It has two extension panels that parents can use to install it in different spaces from their homes. Furthermore, the installation process is very easy, and you do not have too many elements to install. This baby gate is a good option in terms of safety. The U-shaped steel frame is the proof that the producers did not make any quality compromise. You can easily install it in any place that has a width variation between 29.5 and 35 inches. 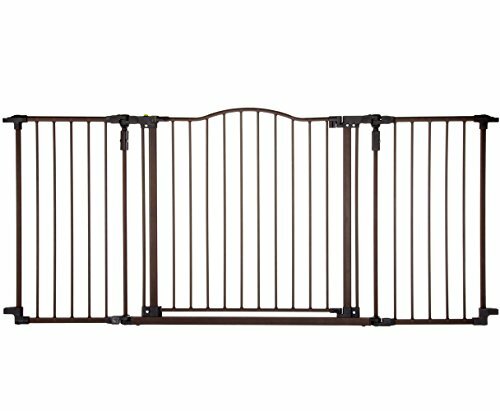 With a 29.5 inches height, this is one of the baby gates on the market that your child will find difficult to climb over. Its double locking mechanism is very easy to open and close by Mom and Dad only. In case your child tries to open it, he or she will find it very challenging. It also has a gravity-fed hinge ramp. This means that it will shut firmly and keep your child safe all the time. Moreover, it can swing in both directions. So, it is very convenient for parents who are always in a hurry and try to do multiple tasks at once. If you are thinking about how well it will fit with your house design, the producers solved this issue as well. It has a clean design and slim profile. What is more, you will clean it very easy with a damp cloth and so keep your child away from germs or bacteria. The multiple colors are excellent for stimulating your kid’s imagination and visual skills. 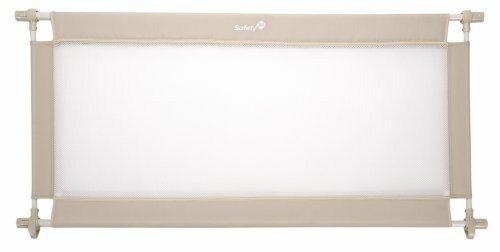 Adjustable from 38" to 60"
If you do not like the metal baby gates, Safety 1st comes with a fabric alternative that will keep the same level of safety and sturdiness as the metal ones. It will fit in any space with an opening between 38 and 60 inches wide. The producers used durable plastic for the frame that has two important characteristics: it is very resilient, but also very soft. You will like the easy installation process thanks to the pressure mounting system. Therefore, you do not need any extra tools to install it. Many parents adore its flexibility. You can easily take and install it to Grandma’s house and make sure that your kid is safe wherever you would take him. The dimensions of this baby gate reach 27 inches in height and 60 inches wide when you expand it fully. This means that you can use it for hallways, at the bottom of the stairs or doorways. 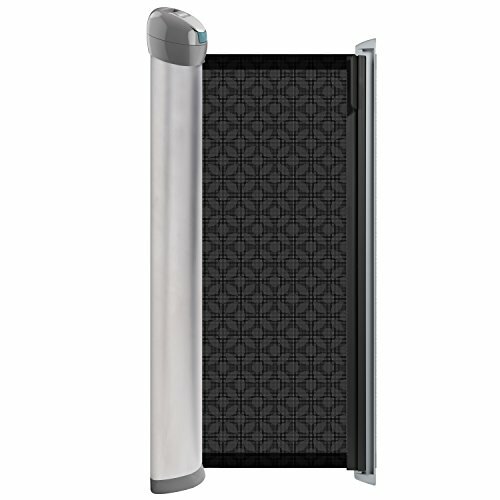 It comes with pressure-mounted rubber bumpers that secure the baby gate to opposing surfaces. If you choose not to expand it, it measures 38 inches. Therefore, it becomes perfect for any types of passageways. The parents, who bought it, like a lot the removable fabric. Thus, they can wash it in the washing machine. This is an excellent feature as it not only keeps your child in a safe zone, but it also protects him from getting in touch with germs or bacteria from the fabric. Another much-appreciated feature is the easy installation process. Also, parents love that it does not weight too much. Therefore, they can move it from one place to the other without too much effort. Moreover, it has a versatile design. The parents who have tested it forgot about the worries that their child would climb over it or move it from its position. You will definitely not regret buying this product. 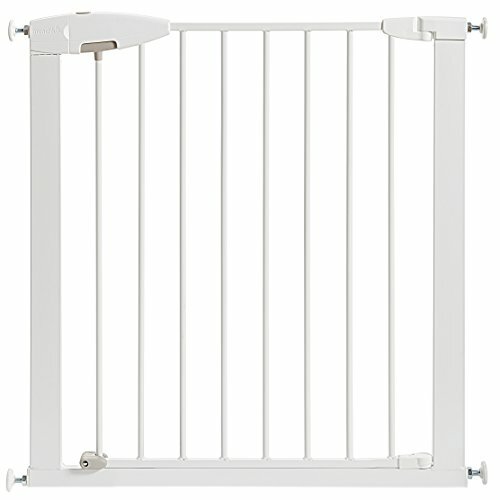 Are you looking for a flexible baby gate that will still keep your kid safe? Summer Infant proposes a retractable gate that seems to do its work excellently. It is a very popular product among buyers thanks to its sturdy mechanism. Therefore, you can place it on top of the stairs and not worry that your kid will remove it. Moreover, it has a simple locking mechanism. To secure it, you can just push the level down if you want to lock it and pull it out to unlock it. For you, it may seem an easy job, but for the kids, it is very difficult. It comes with a hardware mounted system. Do not be afraid by it! In the package, you will find an easy installation kit and instructions to install it. You just have to follow the steps, and you will see that it is not difficult at all. You can use it successfully for areas that are maximum 50 inches wide. It is also 30 inches tall, so it becomes rather difficult for a child to climb over it. The fabric it is made of is very durable, and it fits perfectly with almost any type of aesthetics. In conclusion, after reviewing the best baby gates for 2017, something is very clear: baby gates systems are one of the most efficient ways that keep our children away from unwanted injuries. This is why it is very important to choose those baby gates that you consider the best fit your home’s space and characteristics. Do not compromise for price or materials as the market is plenty of many baby gates options that will meet your requirements. If you already have chosen one of these baby gates, maybe it’s time to have a durable and useful baby walker to develop the motor skills of your little baby. And don’t forget to check these cute toddler beds in the market as well.